I’ve always heard wonderful things about coconut water, but I haven’t done much with it. I finally decided to buy a can at the grocery store this week. I did try it straight before putting it in the smoothie. It’s pretty good! I can definitely see myself drinking it. I did decide to make a smoothie with it. The smoothie is delicious and very sweet. 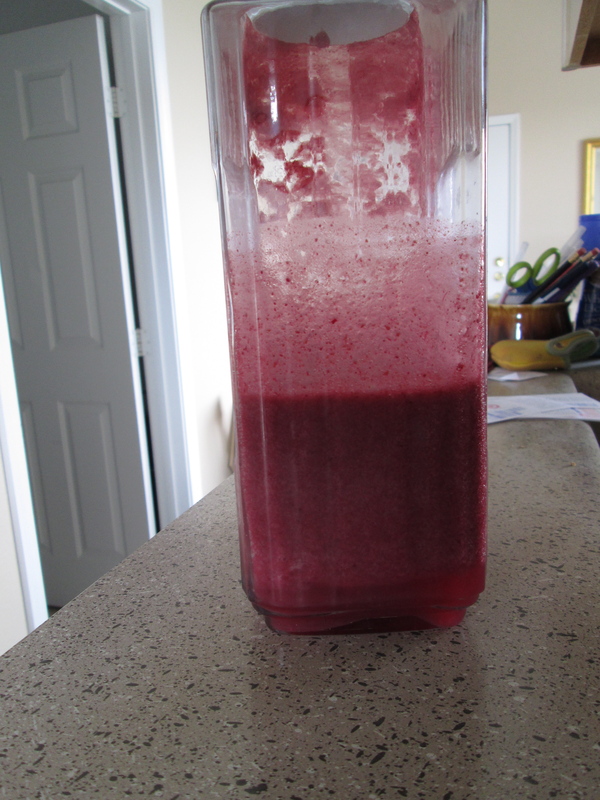 Sorry about the pic…I’d already had some, so the glass isn’t very clear anymore from where I poured the smoothie out. You could easily make this without the chia seeds or with something else. It’s delicious, but I found it didn’t stick with me as well as some of the other smoothies I’ve made. If you can’t tell, I really like to make a big smoothie and then have it for a couple days. Yum! I could see myself drinking this for dessert…. So, by “stick with you”, did you mean keep you from feeling hungry or last in the fridge? It didn’t take away my hunger for a super long time. I think it’s because it has so much sugar in it (from the fruit). It lasted in the fridge just fine, but I did have to stir it a bit before pouring because it separated a bit more than other smoothies I’ve made.